What made the Old-fashioned Whiskey Cocktail old-fashioned when it entered the written record in 1883? Whatever happened to the modern Whiskey Cocktail of about 1860? Back when the specific type of drink called the cocktail (or bittered sling) was new, it was made, mostly, in a way that would later be called ‘old-fashioned.’ About a hundred years later, (circa 1883), the only thing new about the Old-fashioned Whiskey Cocktail was its name – and whiskey was only one of the base spirits made into old-fashioned cocktails. In fact, there is a very good chance that the first sling to have bitters added, making it the first cocktail, was the Rum Sling. If you want an idea of what that might have tasted like, make an Old-fashioned Rum Cocktail. The use of Smith & Cross traditional pot-still Jamaica rum would probably render the best historic analog. Don’t use sugar syrup in any form – that is relatively modern, not old-fashioned, practice. A lump of old-fashioned sugar (such as La Perruche) will suit historic accuracy. Also, don’t put any ice into the drink at all. For the bitters that you will crush into cocktail water with the sugar, the closest historic analog might just be Angostura aromatic bitters (though they weren’t around yet). If you have well water or water from a natural source that is known to be safe, use it. Otherwise, use bottled, flat mineral water. The drink you make this way will probably be as close to the first true cocktail as you can come. It will definitely be even more old-fashioned (but probably not better) than the drink barbarously called “The Old-Fashioned” in bars today. Below is a description of what was just called a Gin Cocktail in 1839, but that would surely be called an Old-fashioned Gin Cocktail in the 1880’s – if only it contained some ice. 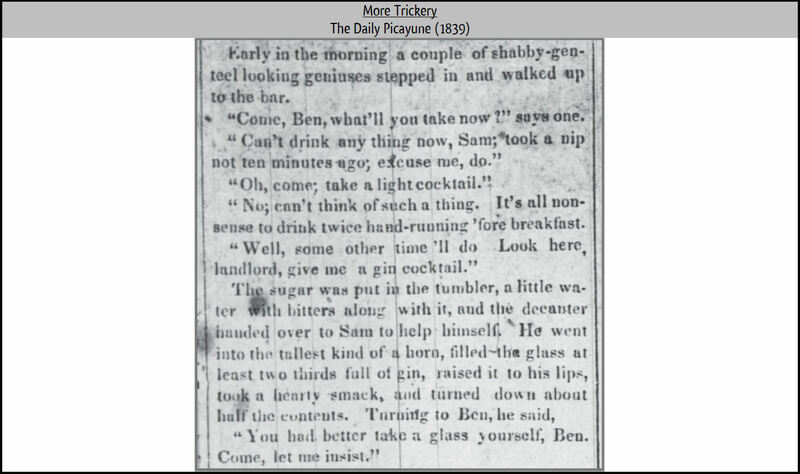 Notice that the landlord (the owner) handed the customer a decanter of gin to pour for himself. Also notice the American tradition of really drinking down the cocktail in a short time. Before Prohibition, true cocktails were not effetely nursed and sipped. So, when did the ice come in as a regular ingredient in a true cocktail? Below is a true cocktail that contains ice, but is still made with dry sugar. By containing ice, this Queue de Chanticleer Cocktail fully satisfies the modern concept of what is old-fashioned in a cocktail. But, ice at that time was still a relatively-expensive and mostly-seasonal ingredient. As it turned out, iced cocktails in bars replete with ice in August would not remain an unbelievable thing for long. By 1856, ice was being manufactured and was available even in hot climates. That only leaves the issue of the sugar. Making sugar syrup out of bottles of relatively-pure, imported water wasn’t financially viable. Adding sugar to water without having a refrigerator to store it in invites quick spoilage. It is not surprising that filtration of municipal water supply and refrigeration were being developed at the same time as the ice machine. Once one could use cheap, pure water to make sugar syrup, and then store that syrup cold, it made sense to do so in American bars. Technological progress progress had given the American bar gum syrup and plenty of ice. As a result, there was an explosion of innovation in American mixological practice. Jerry Thomas’ career did not father that innovation — it fathered his career. It was the right time for someone to write a book. If he hadn’t done it, someone else would have. By the time that Jerry Thomas’ book was published in 1862, pure water was cheap enough that making sugar syrup (including gum syrup) made financial sense. And so with sugar syrup, and plenty of ice for chilling drinks in before straining them into a goblet, one development was that the American cocktail became fully modern. Why Thomas shook his Whiskey Cocktail and bruised the velvet of the liquor with aeration, even though he stirred his Brandy Cocktail, is not something that I can begin to understand. I have often doubted that Jerry Thomas ever really did work as a bar-tender in California during the gold rush. I think he said so in New York to get hired as a bar-tender there. I believe he asked a real bar-tender to tutor him before going off to sell himself. His book never even mentions Pisco brandy in the slightest sidebar — then unknown in New York, but just about San Francisco’s most commonly poured spirit! That, plus his proven proclivity to boldly lie (I invented the Tom & Jerry/Martinez/etc.) and all the nonsensical idiocies in his book (compared to just about every other 19th century book on the subject) smack of him being tutored quickly and often getting his notes wrong. To be fair to Jerry, it should be pointed out that using plenty of ice to either stir or shake a drink with was still very new practice in 1862. Deep intimacy with the different results between stirring and shaking had probably not developed yet. The clash of techniques between stirring and shaking true cocktails wasn’t actually settled until… it’s still not settled. A majority (but not all) of my students say they like the modern Whiskey Cocktail better than the Old-fashioned Whiskey Cocktail. If stirred long enough, it will be colder (at least when served). Being served without ice, it never grows more diluted. If consumed in the traditional three-or-four gulps, it doesn’t have time to get warm. The preference I routinely witness for modern cocktails over old-fashioned cocktails leads me to believe that the modern method of making a cocktail probably took over quickly without much complaint. Even though there were undoubtedly many drinkers in 1862 who still remembered the older method, Jerry Thomas didn’t then present a single drink in his section of cocktails that was not made the modern way. However, within about twenty years of Jerry Thomas’ book, it seems that something caused the older method for mixing the cocktail to come back into vogue. Perhaps it was nothing more than the sentiment of nostalgia. 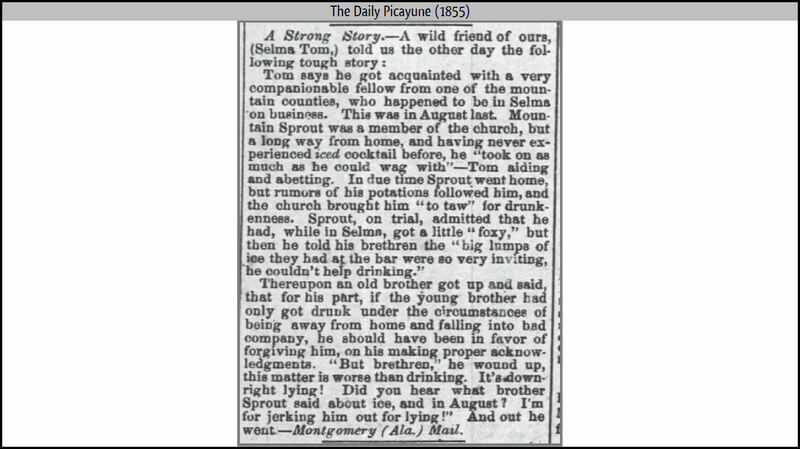 Perhaps, as the following newspaper clipping seems to suggest, some drinkers of true cocktails were willing to have a warmer drink in exchange for one that would be stronger-tasting (if only for a few minutes). 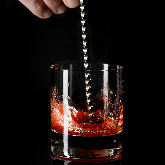 As can be seen from the plural “cocktails” and “them” — and the reference only to “the liquor” — in the above passage, a single drink called “The Old-fashioned” is not what is being discussed. There certainly never was any ‘invention’ of “The Old-fashioned.” All that happened was an older method for making cocktails became fashionable again. The 1883 source explicitly considers that the true cocktail may be made in either modern or old-fashioned ways. As much can be seen in George Kappeler’s 1895 book. Also established by Kappeler is the fact that there was no single drink here. Any spirit could, and still should, be made into either a modern cocktail or an old-fashioned cocktail. Both methods are worthy of enjoyment. Remember, if you use simple syrup, you are making a modern cocktail (even if served on-the-rocks) instead of an old-fashioned cocktail. And whatever you do, don’t ignore English grammar and mistake “old-fashioned” for a noun. It is an adjectival phrase. The noun in both drinks above is ‘cocktail.’ Such silly names as “Scotch Old-fashioned” and “Tequila Old-fashioned” betray not only ignorance of traditional American mixology, but also of English grammar. And, for Bacchus’ sake, don’t call a cocktail “old-fashioned” if you use simple syrup or gum syrup in it! That voids the very most definitively old-fashioned element in an old-fashioned cocktail — the use of dry sugar and making cocktail water out of it! So, there they are — old-fashioned cocktails and modern cocktails. Perhaps one day our drink ‘scholars’ will stop searching the scriptures in vain for the name of the man that supposedly ‘invented’ the so-called “Old-fashioned” at the Pendennis – or for the earliest proof of its existence far too late in the nineteenth century.